Before the advent of agriculture, some 10,000 years ago, mankind lived largely as hunter-gatherers. This is seen as the turning point that marked the origins of civilization. But what if, as Jared Diamond postulated over 25 years ago, the advent of agriculture was “the worst mistake in the history of the human race?” While life as a whole is unquestionably easier due to the technological advances that came with the development of civilization, at what cost to human health? The philosopher Thomas Hobbes, is famous for his assertion that prehistoric life was “nasty, brutish and short,” but is this really true? Archeological scientific literature and our experiences with modern day hunter-gatherer populations, during The Calton Project, have consistently shown this to be false. 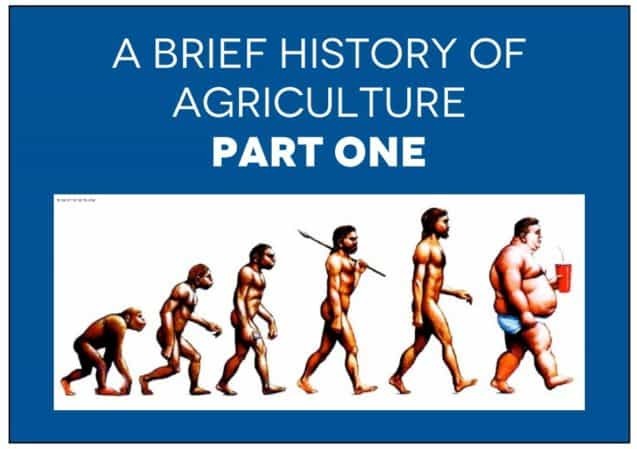 In this four part series, we are going to explore the progression of agriculture over the last 10,000 years and discuss where we went wrong and what we need to do about it. While the lifespan of Paleolithic man is widely reported as having been around 25 years, this is a statistical bias wherein higher childhood mortality rates have skewed the lifespan data. However, provided they made it into adulthood they could live just as long of a life as we do today. In fact, this is still happening in some to the remote areas we visited on The Calton Project where a family may have 11 children, but due to early childhood deaths from a range of causations, pregnancy complications to viral or bacterial disease, only 4 or 5 lived past childhood. Moreover, our pre-agricultural ancestors were taller, had better teeth, larger brains and were free of most of the slew of modern diseases that plague our world today. Grains and legumes are highly inferior to vegetables, fruits and animal products due to the greater levels of the phytochemicals such as phytic acid and oxalic acid which decrease micronutrient bioavailability by binding to them, as we have previouslydiscussed on this blog and cover in depth in our books Naked Calories and Rich Food, Poor Food. Other antinutrients include the prolamines, such as gluten in wheat, lectins, saponins, and tannins that will increase gut permeability, which results in further decreases in absorption and autoimmune responses. Fortunately, the process of soaking, sprouting and fermenting these foods can mitigate many of the effects of these antinutrients by inactivating them, which is why these practices were so prevalent in traditional cultures. However, this does not negate the fact that they are still inferior insomuch as there are no micronutrients in grains and legumes that cannot be found at greater concentrations in vegetables, fruits and animal products, particularly organ meats, as we have also covered in previous blogs. The increased rates of infection were likely the result of increased population density remaining in a single place. This more sedentary lifestyle allowed for more rapid transmission of parasites and disease. Moreover, the malnutrition from micronutrient deficiencies decreased immunity, making individuals more susceptible to infection. Bone and tooth development, as well as height, all deteriorated following the shift from higher quality animal protein to predominantly plant protein. Additionally, the focus on carbohydrates increased the progression of tooth decay. Mind you, our species existed in the hunter-gatherer lifestyle for some 10,000 generations and our genus for many tens of thousands more. There have only been around 600 generations of agricultural society; that is a mere grain in the sands of time. Put anther way, for more than 99 percent of human evolutionary history, we have lived as hunter-gathers. Simple mathematics would show that humans are more than likely adapted better to a hunter-gatherer lifestyle than that of a farmer. Now, this is not to say that just because something existed in the Paleolithic it is better or that if we didn’t eat it back then, that it is inherently bad; it simply provides us with a logical framework. Coconuts and avocados are clear examples of “Neolithic” foods that are incredibly beneficial to us. As well as the development of lactase persistence, or the continued ability to digest the milk sugar, lactose, after weaning, in approximately 35% of the world population. That being said, it is still clear that the shift to agriculture, particularly with our focus on energy-rich, micronutrient-poor grains and legumes, has set us down a path of decreased health. Talk about paradise lost!! So, what can you do about it? Focus on our simple 3-step plan to micronutrient sufficiency, which we outline in Naked Calories. Eat Rich Food, become aware of the EMDs in your life and reduce as many as you can, and supplement using a properly formulated multivitamin like nutreince. Stay tuned for Part II where we will explore the development of industrial agriculture.